Pour into the prepared pan and spread evenly. Bake until a toothpick inserted in the center comes out clean, about 1 hour. I am sharing this recipe with Simply Sugar and Gluten Free, Joy of Desserts, Miz Helen’s Country Cottage, Food Trip Friday, Sweet as Sugar Cookies and Cybele Pascal Allergen-Free Cuisine. This entry was posted in Recipes - Bread and tagged Bread, Cane sugar free, Honey, Maple syrup, Pumpkin, raisins, Yeast free. Bookmark the permalink. This pumpkin bread is delicious, and it works great with any meal, as a bread replacement, or even dessert. Yum! 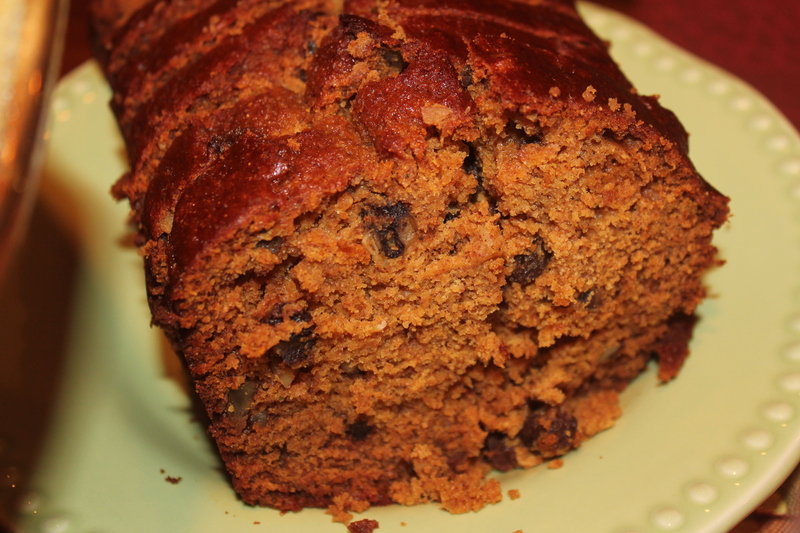 We would just love your Pumpkin Raisin Nut Bread, it looks so moist and is just filled with flavor. This is an awesome recipe! Thank you so much for sharing with Full Plate Thursday. I want to wish you and your family a very Merry Christmas! Wow that looks perfect for breakfast…or merienda…or any time of day really! 🙂 Thanks for sharing the recipe!